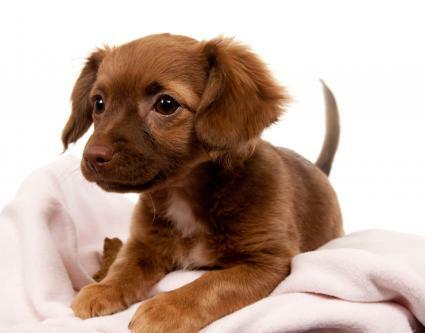 The Chiweenie is one of the cutest dogs you'll find when searching for a crossbreed canine pet. As you may expect, this dog is a cross between a Chihuahua and a Dachshund. Body - The body of a Chiweenie is typically long like a Dachshund, and fairly short-legged since Chihuahuas are typically rectangular anyway. 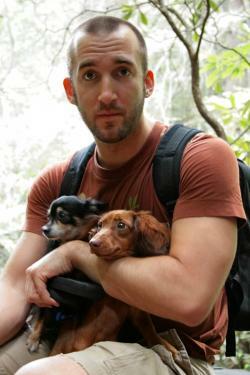 Size - This will vary depending on whether the Dachshund used in the breeding was a standard or a miniature. Full grown standards typically weigh about 24 pounds, and minis generally weigh about 10 pounds. Of course, the Chihuahua's small size figures into the mix, so you can expect a reasonably small dog overall. Head - The head is typically small. The face may either have the long thin snout of a Dachshund or a slightly shorter, more domed head like a Chihuahua. Ears - The ears may also vary; some pups have pointed ears like a Chihuahua while others have the floppy ears of a Dachshund. Feet - The feet are small. Tail - The tail is moderately long. 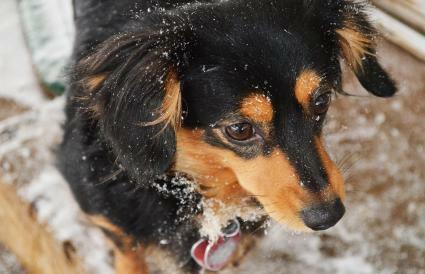 Coat - A Chiweenie's fur ranges from short and wiry to long and silky. This is because Chihuahuas have either long or short coats, and Dachshunds have either long, short or wire-haired coats. So, it all depends on the combination of coat characteristics each Chiweenie pup inherits from his parents' individual coat types. 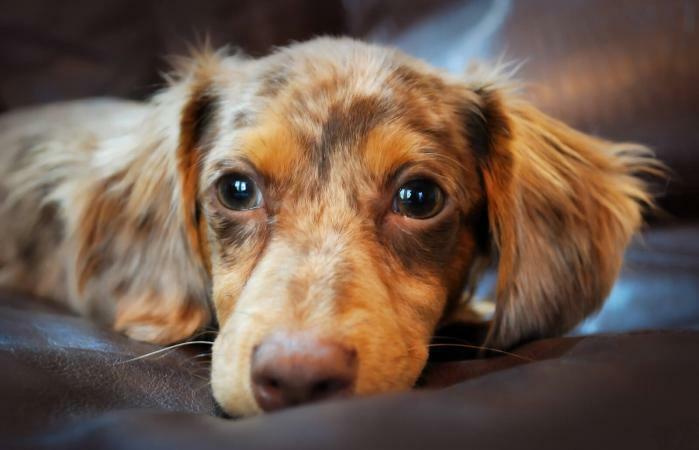 Colors - Just like their parent breeds, Chiweenies come in a variety of colors. 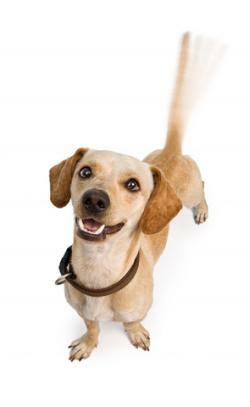 The most common colors are black, tan and brown, but you may also find a dog that is red, blond, white or multicolored. In general, you can expect your Chiweenie to have a friendly personality around people, especially ones he sees on a regular basis. Chiweenies are smart animals and learn very well as puppies. Their temperament can also be a bit stubborn, so training must be reinforced in a consistent and positive manner if you want your pet to obey. Barking is common, and this little dog has a high-energy level. Keep your pet occupied by playing games or taking him for daily walks to prevent boredom and resulting mischief. These dogs also make loyal companions, and they will often favor one owner, and follow that person around. This dog makes a good companion for older children who understand how important it is to be gentle with him to avoid injuring him, especially his back which is susceptible to disc problems. Brush your Chiweenie several times a week to collect loose fur. If he has longer fur, you'll need to brush daily and watch for mats. Bathe your pet about once a month unless there is a real need to do it more often. These dogs do not carry much odor, and bathing them too often reduces their natural coat oil. Trim your pet's nails once or twice a month to keep them from growing long and splitting. Brush you pet's teeth once a week at the very least, and more often if you can. Chihuahuas are prone to dental problems and gum disease, so your Chiweenie's teeth are also at slightly higher risk for decay. PuppyDogWeb.com - This gallery also has a nice selection of photos. DesignerMixes.org - This is a small gallery, but it still offers several photos for you to peruse. 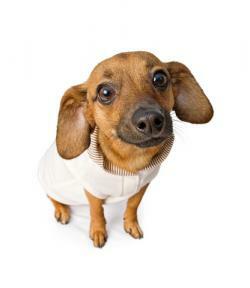 Chiweenies are relatively healthy dogs, and most only experience minor health issues throughout their lives. The most common issue is allergies to dust and pollen. If your dog is affected, his eyes may water constantly. This is especially true if your dog stays inside most of the time. The symptoms can be reduced by investing in air filters specifically designed to remove pollen and changing those filters frequently. Some breeders believe that crossbreeding produces "hybrid vigor." This means the resulting pups should, theoretically, be healthier and not subject to the same genetic issues and health problems that plague their parents' breeds. However, the truth is that Chiweenies can still be susceptible to inheriting any of the conditions to which Chihuahuas and Dachshunds are prone. Hypothyroidism - Also known as low thyroid, this thyroid condition can cause weight gain, skin problems and heart disease. Diabetes - Abnormal insulin production affects the level of sugar in the blood stream. Symptoms of canine diabetes include excessive thirst, frequent urination, poor coat condition and vision loss. Intervertebral Degenerative Disc Disease - This condition affects the neck and back. Symptoms include pain, lethargy, shivering and some degree of paralysis. Seizures - Seizures are the result of abnormal brain activity, which can have a variety of causes. Symptoms include decreased awarness of surroundings, uncontrollable, repetitive muscle movements, salivation, urination and defecation. Luxating patellas - In layman's terms, this means slipping kneecaps. Dislocation of the kneecap leads to pain and lameness. Some dogs can manage with this condition if it isn't too severe, while others will require corrective surgery to lead a normal life. Hypoglycemia - This condition is characterized by a drop in blood sugar levels that can lead to shock. Signs included sudden weakness, shivering, disorientation and a lack of coordination. Seizures are also possible. Dental problems - Chihuahuas have rather small mouths, and tooth crowding can lead to various problems, chiefly decay and gum disease. If the mouth becomes infected, degeneration of the jawbone can lead to tooth loss. Hydrocephalus - This is commonly referred to as water on the brain. Symptoms include excessive doming of the head, an open fontanel (beyond the typical molera naturally found in Chihuahuas), seizures and difficulty walking. Even though these health issues are in a Chiweenie's genetic pool, that doesn't mean that he will automatically suffer from one or more of these conditions. Still, it's important to be aware of them so you can spot a problem sooner if you decide to bring one of these dogs home. The earlier a dog receives treatment for a particular condition/illness, the easier it is to treat, correct or manage. How well you care for your pet, including providing a high-quality diet, good shelter, sanitary living conditions and regular veterinary care, has a lot of bearing on how long he might live. His family genetics are what determines his probable lifespan. Since Dachshunds and Chihuahuas both have fairly long lifespans, you can reasonably expect a healthy Chiweenie to live 10 years at a minimum, but perhaps even as long as 12 to 15 years with optimum care. Since Chiweenies are hybrid or "designer" dogs, they are not recognized by purebred registries such as the American Kennel Club, and they don't have a standard breed description. However, they are recognized by the International Designer Canine Registry (IDCR). Similar to the way the AKC certifies dogs, the (IDCR) registry has certain requirements for registry. Current Chiweenie classification requires a puppy to be one-half Chihuahua and one-half Dachshund. Keep in mind that this is simply a general description of this dog's traits. Each dog is an individual, and how carefully the dog is raised and socialized contributes to its personality and potential to become a good family pet. Review ICDR's Roster of Registered Kennels to identify reputable breeders offering Chiweenie puppies for sale. The cost of purchasing a Chiweenie varies quite a bit, with the average price ranging from $200 to $550. Of course, prices change all the time. You may find dogs available for higher or lower prices. Before you decide to purchase a particular pup, make sure you choose a reputable breeder. These dogs are often sold at a hefty price as a "designer dog", so you want to make sure the seller is completely honest regarding the health history of both the sire and dam, as well as the puppy. Insist on copies of the parents' shot records along with any other certifications the breeder may have. Is a Chiweenie the Right Dog for You? Now that you know more about Chiweenies, you can begin to decide if one would fit well with your lifestyle. After reviewing the full scope of "Chiweenie dog 101" facts and making up your mind, the next step is to locate a breeder in your area and visit a couple litters. This way you can see what these puppies are really like, and you can also see the parents of any pup you consider purchasing. By meeting the sire and dam, you can estimate the ultimate size your Chiweenie puppy will reach, as well as make sure the parents' temperaments are sound.